Our modern lifestyles leave many of us overly investing our time into our work. This can leave us unhappy, time poor, and can be detrimental to our overall health. 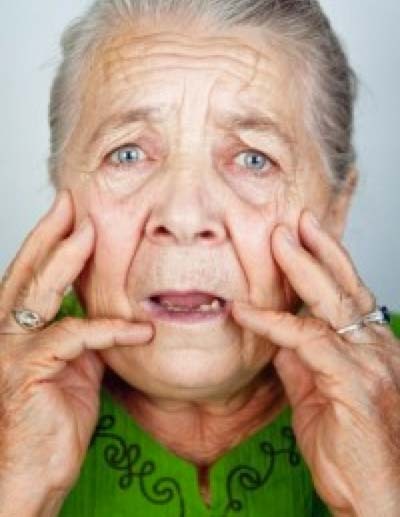 Dehydration is one of the leading causes of wrinkles. Margaret above just turned 25, she doesn’t drink enough water. Work-life imbalance will leave you stressed, lacking sleep, and under-performing at work. Luckily there are plenty of small, easy to implement changes you can make to your daily routine to dramatically improve the way you feel and look. Below are 5 tips, which if you can implement into your daily routine will help give you more energy, aid in deeper and more refreshing sleep, boost your immune system, and help you lose weight. You already know you should be doing this, and have probably even tried to increase your consumption previously but fell back into old habits. Start measuring how much water you drink each day and keep track of it. Not only will drinking at least 8 cups of water a day (more if you are exercising, working outdoors, or in a hot climate) help you flush out toxins and maintain optimal hydration levels, it will also keep you looking younger. Dehydration is one of the leading causes of dry skin and wrinkles! There’s no need to buy bottled water either. Reduce excessive plastic waste by buying a filter, and refill your own glass or stainless steel bottle each day. Reducing your exposure to plastic will help keep carcinogenic, endocrine disrupting chemicals like BPA and Dioxin out of your system too. Sure it’s convenient to pick up a packet of potato crisps or a sugar-filled chocolate block to snack on but what are the consequences? These nutrient poor food substitutes are making you fat and filled with nasties that cause strain on your system to process and digest. Go to the minimal extra effort to pack an apple or a few bananas to eat instead. You’re body (and waistline) will thank you for it. 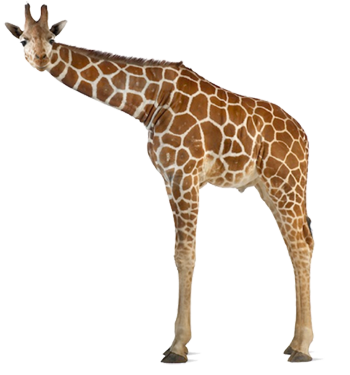 Ever seen a fat giraffe before? Nope. That’s because they don’t eat butter OR margarine! Fruit is full of nutrients that help in boosting your immune system and allow your body to function at a higher level. 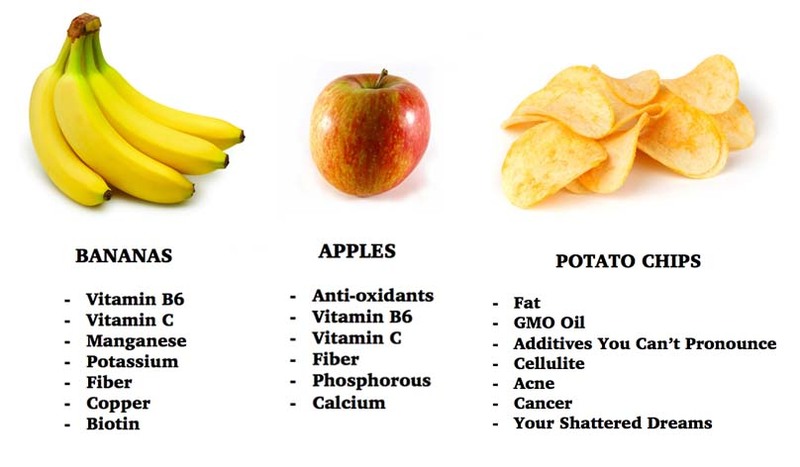 Instead of ingesting processed poisons that your body has to work hard to break down and remove, boost your energy levels and give yourself better skin and a trimmer tummy as a result. Q. Which spread is better for you, butter or margarine? A. It doesn’t matter. Both are clogging your arteries and making your fat! Cut both of these spreads out of your diet immediately. If you really need something to soften up dry bread, try some avocado instead. Once you become accustomed to eating butter and margarine free sandwiches, you’ll realize you never needed them anyway. Remove all unnecessary fats and oils from your diets such as these and watch the pounds fall off! How do you like your steak – rare, well done, or with a side of colon cancer? With increasing awareness of the impact meat eating has on the environment and the horrific ways farmed animals are treated, meat consumption is already becoming passé. Reducing or stopping your meat intake not only benefits the environment and the animals however, it also benefits you! Animal flesh, especially red meat, is hard for your body to digest. 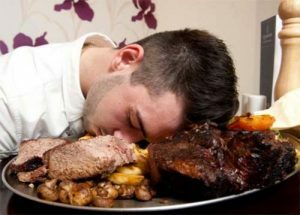 This is why you feel exhausted for several hours after eating a big steak. Breaking down meat causes stress to your system and depletes it of energy. Consumption also has a high correlation with the 5 most common killer diseases including colon cancer and heart disease. Try substituting with beans, legumes or nuts for one or two meals a week. You’ll still be getting all the protein you need and you’ll have more energy because of it. If you are lacking in iron then add more leafy greens to your diet ensure you get all the nutrients you need. Late night kebab store owner Ali Kebaba does not endorse this message. Our career-oriented lifestyles mean we often come home from work hungry and ready to eat a big meal before we sleep. This habit is not a healthy one and reduces our body’s own ability to heal itself. Our bodies naturally heal themselves while we sleep. If we have a stomach full of food however, our cells cannot repair at an optimal rate until it is digested. This is the reason why animals do not eat when they are sick. By not eating they give their immune system more energy to fight off any infection or disease. In order to maximize your healing abilities, reduce the sizes of your meals and eat earlier in the evening. Try to eat foods that are easier to digest such as vegetables and fruits, instead of dense foods such as those containing carbs and meats. This will let your body process the food at a faster rate and have your DNA and cells repairing as soon as you hit the sheets. If you don’t manage to eat by 8pm, simply have a snack of some fruit or a small salad instead and save your appetite for a big breakfast the next day. We’re so confident that these 5 simple and easy to implement steps will change your overall health, that we challenge our readers to try it for just 2 weeks and feel the difference. See if you can stick to these healthy habits and let us know how you feel after making the changes. Once you start feeling great and looking even better you might even decide to stick to your new healthier lifestyle. We’d love to hear your story so let us know how you go! Not only will you lose weight; you’ll lose excessive body hair, gain better posture and your clothing will shrink!